Kerry Lord, 31, is easily one of the most dedicated designers we’ve come across. Even when she goes on holiday, she packs 3kg of yarn with the intention of designing a new toy every day she’s away. 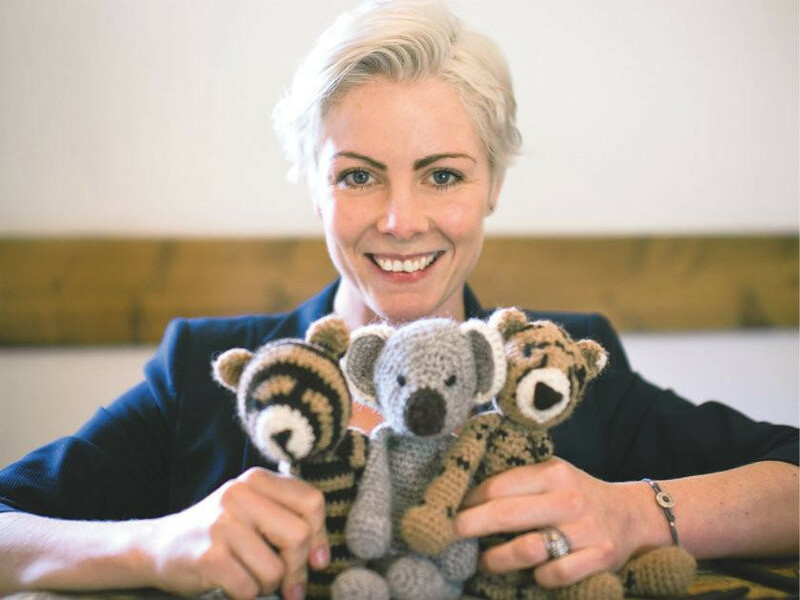 We asked her how she can have time to work on her business, look after her young family and design the amigurumi animals we love so much. My husband Doug, my four-year-old son Edward and I have just moved on-site to the farm at TOFT. Hopefully this will be okay as I’m expecting a baby girl as well! Previous to that I studied English Literature at York University and then we lived in Leamington Spa for ten years. Congratulations! Is your family a big part of work life? Yes, they’re very supportive and I work with a fantastic team. Team TOFT comprises of 14 very talented and enthusiastic creative women. I really couldn’t do it without them. I always loved collecting stones and pebbles and I used to paint them different patterns and colours, and fill windowsills with them. When did you first try knitting? I took lessons about ten years ago. I grasped the basics pretty quickly, but have found little time to practice since then as I’ve been too busy with TOFT. What is the first thing you knitted for yourself? I absolutely love skiing, so it was a big chunky beanie to wear on one of my trips. We go once a year with a large group of my old school friends. What’s your favourite thing to make now? I love inventing new animal and monster characters. I design on the hook so they’re a bit like sculptures. I’m always designing on the go, I must own at least 30 3mm hooks which are dotted around my house, office, car and every handbag I own. Every time I complete a new creature I’m delighted! I get just as much satisfaction as I did after my very first design, which was an elephant, and he ended up in my first book, Edward’s Menagerie. I taught myself when I was pregnant with Edward. I’ve rapidly become obsessed and knitting was soon overshadowed! It’s great because it’s portable (always in my handbag) and much, much easier to fix when something goes wrong. Where is the weirdest place you’ve been caught with your hook out? No such thing – it’s never ever weird to have your knitting or crochet out (apart from if it is a two-metre tall flamingo, you might get a few raised eyebrows). If you fancy a regular-sized flamingo, he’s in my book, Edward’s Menagerie. How about making your own yarns? Have you ever tried spinning or dyeing? I don’t think I’m patient enough for spinning, but after struggling to find shades that I wanted in the shops, I tried my hand at dyeing not long ago, and I can see myself getting into it! What are your favourite shades to work with? That’s an easy one – Grellow! My two favourite colours are slate grey and deep mustard yellow. It reminds me of rainy puddles and old-fashioned rubber wellingtons. TOFT, of course! We’ve just brought out three new rich Autumn shades; Fudge, Camel and Chestnut, and it’s safe to say, I’m totally addicted. When did your passion become a proper business? I did some research into what could be done with alpaca fibre. This quickly uncovered a growing appetite for craft and good-quality British materials. Then, when I learnt to crochet the business accelerated and grew to a new level. Toft is the name of the town we’re in – set on the side of a reservoir, surrounded by picturesque Warwickshire countryside. Sounds like a really inspirational setting – what designers do you find inspiring? I admire the knitting skill and heritage of Rachel Coopey and Kate Davies, and Lydia Tresselt’s crochet designs are fun. What advice would you give to people starting to design? Be constantly creative. Make something every day. It’s very easy to lose your creative time when you are doing all the other daily tasks establishing a business. Do you teach as well? Yes, I must have taught thousands of people to knit and crochet at our studio. Teaching someone is a fun and social way to spend an afternoon. Even if you can’t come to TOFT, in my new book Edward’s Imaginarium, I show how to design any creature from your imagination. What’s the weirdest thing that’s happened to you on a workshop? Sitting among a somewhat giggly team, our patient colleague Rosie attempted to teach ten of us to make an origami alpaca for the first time. Mine resembled a chewed napkin (despite excellent tuition). I won’t be showing you a picture of that! Follow Kerry’s work in progress and her love of cake on her Instagram feed @toft_uk.